NIA's latest newsletter NanoNews is now available HERE. NIA had a quite active January with the launch of our Nanopavilion and the addition of three new members to the NIA family. 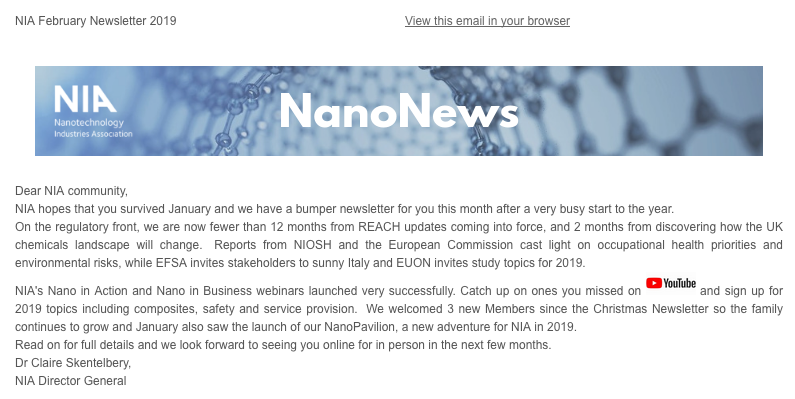 Join our webinar on 6 February 2019 1500 CET to learn more about the Nanopavilion and its participating Members HERE. As well, read about all the latest regulatory news including reports from NIOSH and the European Commission on occupational health priorities and environmental risks. Finally, keep up with NIA's upcoming activities. NIA is starting the new year with a very busy calendar including its 8th Annual Symposium, new webinars in its two new series Nano in Action and Nano in Business and more. Catch up on our previous webinars by suscribing to our YouTube channel HERE. Make sure to not miss our next NanoNews by suscribing HERE.